Wetlands come in many different shapes, sizes, and types. They vary in the amount of water they hold, how long they hold water, and the type of vegetation they support. Not all wetlands have standing water during the growing season. The U.S. Fish and Wildlife Service divided wetlands into 8 types (Types 1-8). The two primary characteristics used in the classification system include the wetland's dominant plant type and water depth during the growing season. 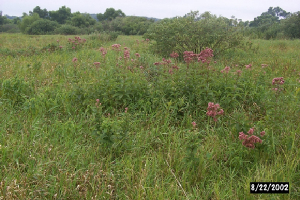 Wetlands monitored in WHEP are depressional wetlands with emergent marsh vegetation (Types 3, 4, or 5). 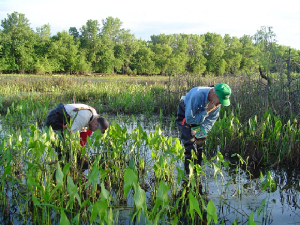 The Minnesota Pollution Control Agency designed and tested the WHEP sampling protocols for Type 3, 4 and 5 wetlands located in the Central Hardwood Region of the State of Minnesota. Wetlands sampled in WHEP are chosen by the sponsoring agency (City, Watershed Managment Organization, Park Department, etc.). Wetlands monitored in the currrent season are listed below. Select the wetland name to download a map to that wetland.